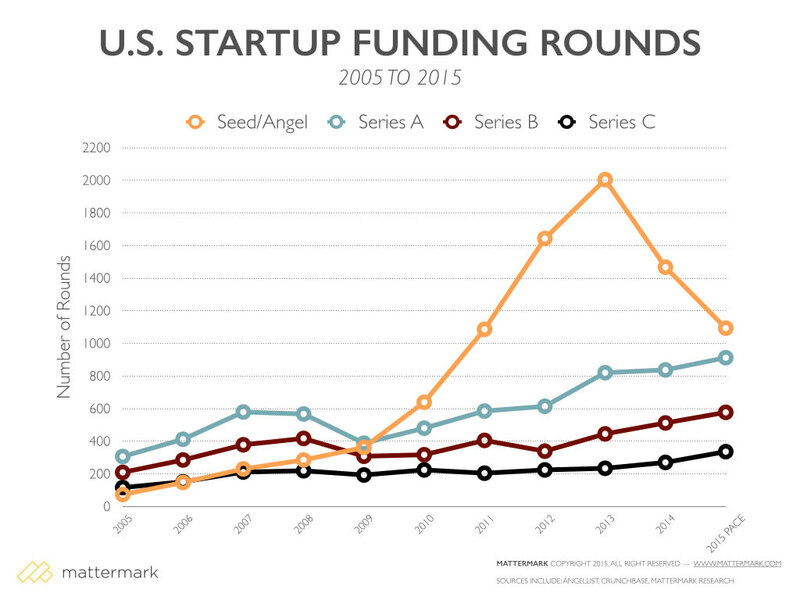 In terms of absolute number of rounds at each respective stage, we see that series A, B, and C round volume has continued to climb. Series A is on pace to see a 197% increase in deal volume this year versus 2005, while Series B is up 175% and Series C is up 188%. Despite the increase in deal volume, from the founder’s perspective the post-seed crunch is still very real. With an enormous increase in seed funding over the past 10 years, beginning in 2010, competition for entering the venture-backed echelon of companies is fierce and the backlog of companies looking to raise a Series A may be at it’s highest ever, with the addition of second seed rounds it is possible companies from the 2012, 2013, and 2014 are all vying for Series A dollars. To understand the kind of Series A volume that would be required to satisfy this demand, we looked at historical graduation rates from Seed to Series A. For this analysis, I took all companies that have raised a seed round and looked at their current outcome by cohort year. It is important to bear in mind that the more recent cohorts are not yet “complete” meaning companies who raised seed in 2013 and 2014 would not necessarily be expected to have raised their Series A yet, and more data will continue to roll in as time passes. 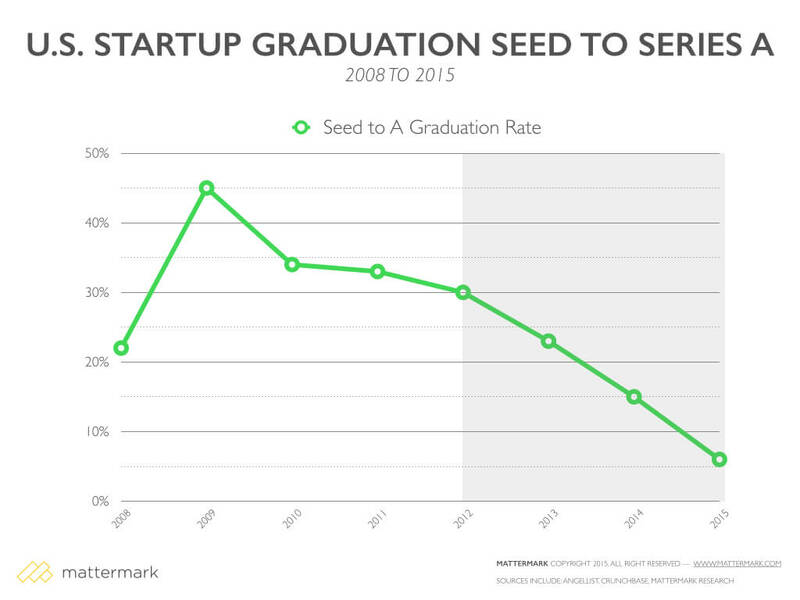 This data indicates a graduation from announced seed round to Series A of 33% on average. If we take the remaining cohorts from 2012 onward and calculate how many startups would need to receive their Series A in order to make that average true, we see that 679 existing startups are competing for Series A rounds in the coming months, however with just 4 months left in the year the current pace for this stage suggests only 284 deals are left to be announced in calendar 2015. Models don’t predict future reality (they describe the past reality), and great companies certainly get funded in the face of financial indicators all the time, but from a pipeline perspective investors have rarely had more choices in front of them at the early stage. What does this mean for founders? If you’re working to raise a Series A you should expect it might take a bit longer unless you are in the top 10% in terms of revenue, traction, and reputation. Investor terms may not be as founder-friendly for those who are in crowded markets or lower-margin business models because the selection of operators to take on these challenges is more competitive, and these are inherently higher risk than a high margin premium product. We would not be surprised to see e-commerce, on-demand marketplaces, payment processing, peer-to-peer loans and any business where the company acts as a transaction intermediary feel downward valuation pressure — especially if they are run by founders without former domain experience. Uncertainty about the macro-economic environment (which you can’t control) may have some partnerships in wait-and-see mode while they consider the trade-off of holding back more money to support existing investments versus taking on new ones. “Second seed” deals will continue to take place, helping startups who need to hit additional milestones stay alive to fight another day. Valuations around the hottest deals will continue to be market-priced, but it is possible that valuations for Series A have reached a peak and that savvy founders will recognize it is better to get the round done quickly and with good people than it is to optimize valuation. Beyond price, the quality of Series A investments (in terms of traction, revenue, milestones) versus previous cohorts may be at it’s highest level yet due to more time/money invested prior to this round and the decreasing cost of running a startup. As always, time will tell and we look forward to reporting on the ongoing deal activity here.